News reports that deem a gender gap in polling noteworthy — with women as more Democratic and men as more Republican — are falling into a trap described by a journalistic cliché: They’re reporting when a dog bites a man. That’s because it would be far more unusual — akin to a man biting a dog — for there not to be a gender gap in a federal statewide race. First, as most readers surely know, there’s been a noticeable gender gap in presidential voting for the last 30 years. Chart 1 shows how men and women have voted going back to 1972, when the national exit poll started. Remarkably, men and women voted for Jimmy Carter and Gerald Ford in precisely the same proportions in 1976. The real gender gap started in 1980, when men preferred Ronald Reagan to a much greater extent than did women. Since then, women have regularly voted 6-10% more Democratic than men — or if you prefer, men have voted 6-10% more Republican than women. What may not be so well known is how persistent this gender gap is in individual state-level presidential battles and also in Senate contests. We went back and looked at hundreds of exit polls since 2004 in presidential and Senate races and found that 87.5% of statewide Senate and presidential races featured a clear gender gap, which on account of poll error we are defining as the Democratic candidate doing at least three net percentage points better with women than with men. Of 273 state-level presidential and Senate polls we analyzed from 2004 through 2012, 239 showed the Democratic candidate doing significantly better among women than men. Another 27 had no gender gap, falling within plus-or-minus three net points. Then there were only seven where the Republican candidate actually did significantly better with women than they did with men. Those seven contests were: George W. Bush in Missouri, Montana and Texas (2004 presidential); John McCain in Nebraska (2008 presidential); Sen. Olympia Snowe (R-ME) in her 2006 reelection; Sen. Orrin Hatch (R-UT) in his 2006 reelection; and Cynthia Thielen (R-HI), who otherwise was trounced by Sen. Daniel Akaka (D-HI) in his 2006 reelection. Snowe, who retired in 2012, is a good example of a moderate female Republican who “broke” the traditional gender gap we’ve seen in recent American politics. A full breakdown of the average gender gap we found in all 50 states from 2004 through 2012 is shown in Chart 2. Just to be clear about how we calculated this chart, let’s look at Ohio’s presidential results. From 2004 to 2012 (three races), the Democratic nominees won women by an average of 6.3 percentage points. Meanwhile, they lost men by an average of 3.0 points. That’s a 9.3-point “gender gap,” which is what we reported in the “gap” column. States are ordered by the size of their average gender gap in presidential elections. Notes: Click on the chart for a PDF version. A longer note about which Senate exit polls were included in this chart is printed at the end of this story. Senate elections won by independents were excluded from our averages. *Indicates states where there was no exit poll for 2012. Source: Exit polls cited in this study are from CNN.com for 2004, 2006, 2008, 2010 and 2012. As is shown in Chart 2, there’s only one state — Nebraska — where men were consistently more Democratic than women in presidential races. In Senate races, Utah is the only state where men were more Democratic than women. Again, women almost always vote more Democratic than men. It’s worth noting that there is some relationship between each state’s gender gap and how it voted in the 2012 presidential election: Running a correlation analysis, we found that r = .41. If one examines Chart 1, this makes some sense: The four states with the largest gender gaps all voted strongly Democratic in 2012 while the seven states with the smallest gaps were all strongly Republican. Still, the results in states such as Kansas and Hawaii run counter to this pattern. With a small sample size in the number of presidential exit polls per state (two or three), it would be unwise to make any bold claims about what this might mean; more long-term analysis is needed. Also, let’s remember that exit polls, just like pre-election polls, are an imperfect tool. While we believe they are generally fairly accurate, they have flaws, too. Still, the exit polling evidence of a consistent gender gap in statewide federal races is overwhelming. 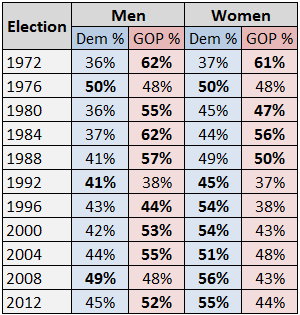 We already mentioned Maine’s big gender gap in presidential elections; on the other side of the presidential spectrum is Alaska, which has a major gender gap but is still reliably Republican because women there continue to vote for the GOP, albeit in lower percentages than men. However, women supported Tony Knowles (D) in his unsuccessful 2004 Senate contest against Lisa Murkowski (R), and a 30-point gap between men and women was enough to power Mark Begich (D) to a victory over Last Frontier legend Ted Stevens (R) in a 2008 Senate race. Stevens won men by 16, while Begich won women by 14 (a 30-point gender gap, bigger than the average gap found in any of the 50 states’ Senate or presidential contests over the past decade). A good example of how the greater proportion of women in the electorate can swing an election is demonstrated nicely in Virginia’s 2006 Senate race: Jim Webb (D) won women 55%-45%, and George Allen (R) won men 55%-45%. According to the exit poll, women made up 51% of that year’s Senate electorate. Hence, Webb won by four tenths of a percentage point. In presidential races, women almost always make up a larger percentage of the electorate than men. Of the 131 presidential exit polls we studied, women outnumbered men in 120 of them. Instances of electorates with an equal number of men and women, or even more men than women, are slightly more common in midterm years when turnouts are lower. But even then, women still make up the majority of voters in most contests. — More likely to favor legal abortion without restrictions. Those positions, of course, generally align with the Democratic Party, which helps explain why women are more Democratic, and men are more Republican. The gender gap between men and women is an important reality in American politics, one that we’ve had for at least the past 30 years. Just because it has existed in recent elections doesn’t mean that it always will. But for the time being, reporters and analysts of American politics should remember this when they look at polls: It’s not news when there is a gender gap; rather, it’s news when there isn’t. — U.Va. Center for Politics intern Dahler Battle assisted us immensely in compiling this information. Some Senate results were not included because of a lack of exit polling and because of independent candidates (e.g. Maine in 2012). What follows is the full list of the Senate exit polls that make up the averages in Chart 2: Alabama: 2004, 2008; Alaska: 2004, 2008; Arizona: 2004, 2006, 2010, 2012; Arkansas: 2004, 2010; California: 2004, 2006, 2010, 2012; Colorado: 2004, 2008, 2010; Connecticut: 2004, 2010, 2012; Delaware: 2008, 2010; Florida: 2004, 2006, 2010, 2012; Georgia: 2004, 2008; Hawaii: 2004, 2006, 2010; Idaho: 2008; Illinois: 2004, 2008, 2010; Indiana: 2004, 2010, 2012; Iowa: 2004, 2008, 2010; Kansas: 2004, 2008; Kentucky: 2004, 2008, 2010; Louisiana: 2004, 2008, 2010; Maine: 2006, 2008; Maryland: 2004, 2006, 2012; Massachusetts: 2006, 2008, 2012; Michigan: 2006, 2008, 2012; Minnesota: 2006, 2008, 2012; Mississippi: 2008, 2008(s), 2012; Missouri: 2004, 2006, 2010, 2012; Montana: 2006, 2008, 2012; Nebraska: 2006, 2008; Nevada: 2004, 2006, 2010, 2012; New Hampshire: 2004, 2008, 2010; New Jersey: 2006, 2008, 2012; New Mexico: 2006, 2008, 2012; New York: 2004, 2006, 2010, 2010(s), 2012; North Carolina: 2004, 2008; North Dakota: 2004, 2006; Ohio: 2004, 2006, 2010, 2012; Oklahoma: 2004, 2008; Oregon: 2004, 2008, 2010; Pennsylvania: 2004, 2006, 2010, 2012; Rhode Island: 2006, 2008; South Carolina: 2004, 2008, 2010; South Dakota: 2004, 2008; Tennessee: 2006, 2008; Texas: 2006, 2008; Utah: 2004, 2006; Vermont: 2004, 2010; Virginia: 2006, 2008, 2012; Washington: 2004, 2006, 2010, 2012; West Virginia: 2006, 2008, 2010; Wisconsin: 2004, 2006, 2010, 2012; Wyoming: 2006, 2008, 2008(s).